Well, this old adage was put to the test by me in reading The Child Goddess by Louise Marley. 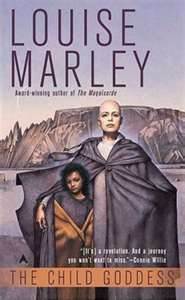 I was perusing at our local used bookstore here in San Antonio and made it to the science-fiction section to see this striking cover of a bald woman with her right arm around a child. It intrigued me and knew instantly I would be reading this novel. It’s a surprising literate story about a woman named Isabel Burke, who is a Priest from the Order of Mary Magadalene (she has been a popular topic in a lot of modern fiction recently) and her relationship with a child named Oa from the planet Virimund who can not age. The child is about a hundred years old, but her body and mind has not reached beyond the pre-pubescent stage. The scientific community thinks the child is carrying a gene that could lead to an anti-aging virus and make them famous. The priest thinks differently and has developed a relationship with the child. However, the novel goes well-beyond the stereotypical science versus religion argument and shows both sides in a fair manner in dealing with this kind of dilemma. Also, the characters are well developed and shows the priest having an honest dose of human desire as well and not trying to be a perfect religious person. As a matter of fact, the story reveals rather adroitly Isabel’s feelings for a married prominent scientist that causes a realistic tension between them as they worked together to find out about Oa’s condition. The best speculative fiction stories always ask the question, What If? The story succeeds admirably in that regard and reminds me of a novel that Ursula LeGuin would write but substituting her Taoist perspective for a Catholic perspective instead. The Child Goddess is not the greatest novel ever written. However, Louise Marley gives us the insight into the second question an excellent speculative fiction story should ask, What does it mean to be human? For that, I applaud the author in giving a possible answer in such a non-conventional manner. I will include The Child Goddess as one of my favorite books I’ve read and reviewed for the blog in 2012 and even recommend it to those who would not usually read this genre of fiction. Moreover, I guess the old adage can be true every once in awhile. You can judge a book by its cover!